Some of the most energizing custom wallpaper projects we've undertaken are man caves. The man cave, that space solely dedicated to the man of the house. And why not? If your man works hard, reward his man cave with a custom wallpaper mural that will truly suit his taste. For example, all of the sports fans out there could easily get behind a stadium spectator mural. 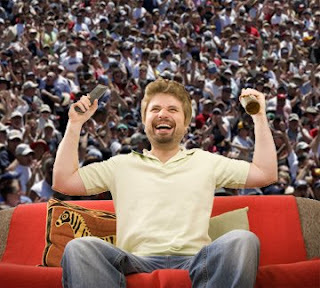 What better way to capture the exhilaration of game day than your hubby's very own packed house of fans seated squarely behind him, cheering him on as he applauds for the home team. As wallpaper goes, it doesn't get any sportier than this. Use your own image from a sporting event for an even more personalized custom wall mural. Other favorite man cave murals have consisted of cars, in either large photo mural form, or patterned together to create a custom wallpaper border. This can be used in a man cave, or even the garage if that happens to be your man's hangout. Perhaps your partner has more subtle taste; no matter, we can tailor any man cave wallpaper to coordinate with any host of hobbies or interests. Contact us to learn more!